Cash Inferno Slots is a pretty basic slots machine that did offer a few basic bonus features. I thought the designers did a very nice job of making the two features they did decide to include go a very long way and there was actually a lot of excitement packed onto this machine. The first thing I noticed about this machine were the symbols. I loved the fact that all of the symbols were very theme oriented as this really helped bring the theme to life which made the game more engaging and thusly more exciting. I also thought that the special symbols really stood out and this helped build up the anticipation as you knew when you were on the verge of a big win. The betting options should prove to be more than sufficient for almost all players. The betting range was very serviceable as players could spin the reels for as little as a penny or for as much as 225 dollars. I can’t imagine that there are very many players out there who won’t be able to work with this range. There were also nine different pay lines that players could bet on before any given spin. Usually I prefer a few more pay lines included on my machines but I didn’t think this was too big of a problem seeing as there weren’t a ton of different symbols being used. The wild symbol offered on Cash Inferno Slots was a picture of a Dalmatian with the word “wild” underneath it. This symbol appeared on every reel and could be used to substitute for any symbol in the game other than the bonus hat symbols. For starters, I really liked the fact that this symbols was very easy to identify which helped it provide a lot more excitement. Normally, I would like to see a few more things added to the wild symbol, such as a prize multiplier, but I thought nothing else was really needed since everything else was kept so simple and it still had a large impact on the overall gaming experience. 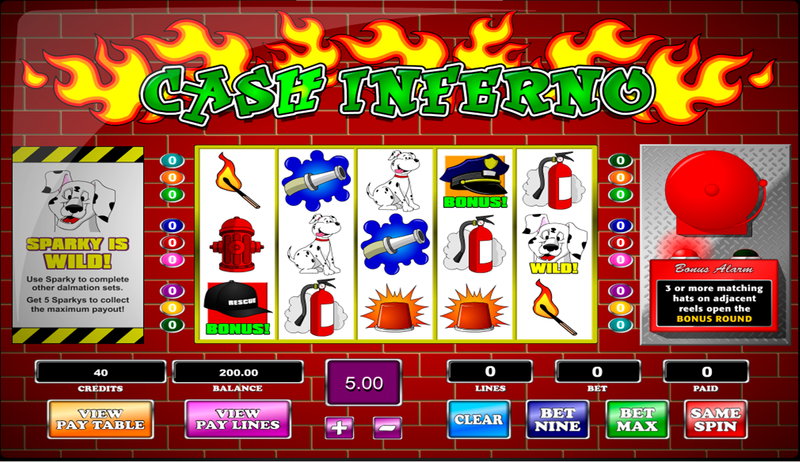 The bonus game offered on Cash Inferno Slots was activated whenever three or more bonus symbol appeared anywhere on the screen together at the same time. There were three different bonus symbols, all pictures of different fireman’s hats, but they all served the same purpose. Whenever the bonus game was activated players were taken to a different screen where you had to open up windows on a burning building. Each window revealed a prize multiplier that would multiply your triggering bet. You continued opening up windows and receiving multipliers until you opened a window that revealed a “finish” sign. The more bonus symbols you used to activate the bonus game the higher the prizes that were awarded and if you clicked on the “finish” window on the first try you received all the prizes that were available to win. I thought this was a really cool bonus game because it was really easy to obtain and if you got even a few good windows opened you could really win a lot of money. Overall, I thought this was a really cool slots machine for how simple everything was. The designers really didn’t try to overdo things on this machine. They just offered up some very well executed, very traditional features and relied on them to provide enough excitement to keep players interested for extended periods of time. I think they were very successful in doing this and that’s probably why the slots machine succeeded.